Every once in a while a few comic books would show up at the supermarket at which my mother regularly shopped. There wasn’t any rhyme or reason to how, when or why–they may simply have been copies that got sorted in with the other magazines by mistake. In any event, this turn of events presented me with this issue of THE JOKER during one such shopping trip. I can’t say that I had a strong desire to read a book about the villain, and I wasn’t at all enamored of Sherlock Holmes–but then, a comic book is a comic book. Giving the Joker his own magazine was one of a number of odd decisions that DC made during this period, as it and the rest of the industry thrashed around wildly looking for something, anything, that wold comprise the next hit and pull the business out of the doldrums it had fallen into. 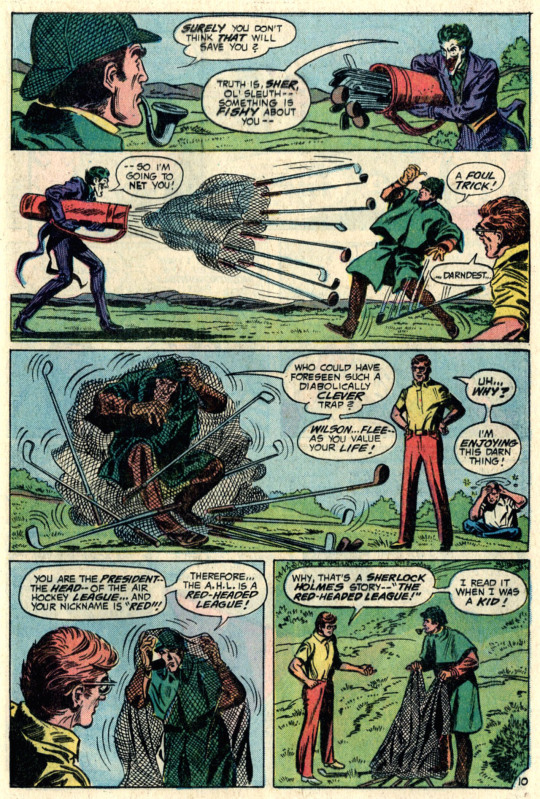 Particularly difficult was the fact that the series would still need to be approved by the Comics Code, whose bylaws stipulated that a criminal like the Joker couldn’t get away with anything or succeed in any way. So it’s a book about your favorite villain having his plans foiled issue after issue–doesn’t seem like a recipe for success to me. 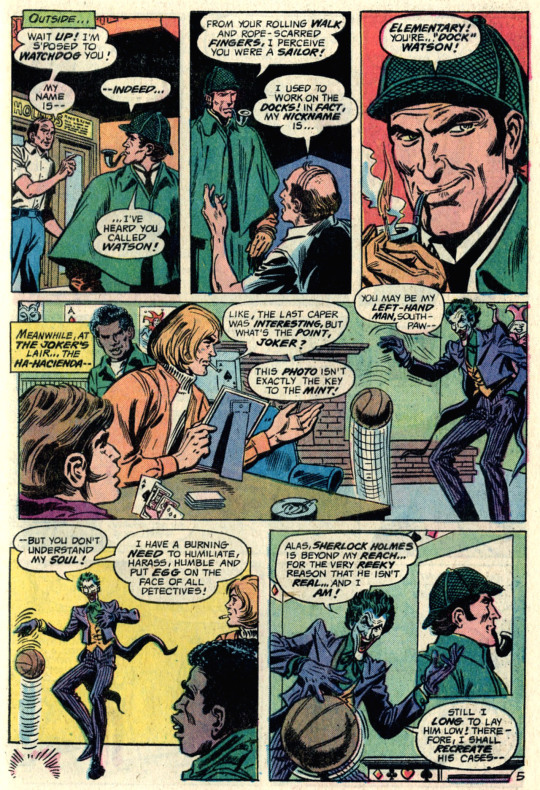 DC was also planning a Sherlock Holmes series at around this time, so it’s also a strange bit of cross-promotion, even though the Holmes in this story is actually a brain-addled actor whom the Joker clobbers with his own pipe while stealing a painting from a theater production. Actor Clive Sigerson now believes himself to be Holmes–and because the Joker impersonated the actor playing Moriarty to gain access to the production, he goes off in pursuit of the Clown Prince of Crime, accompanied by a stagehand who happens to be named Watson. Of course. 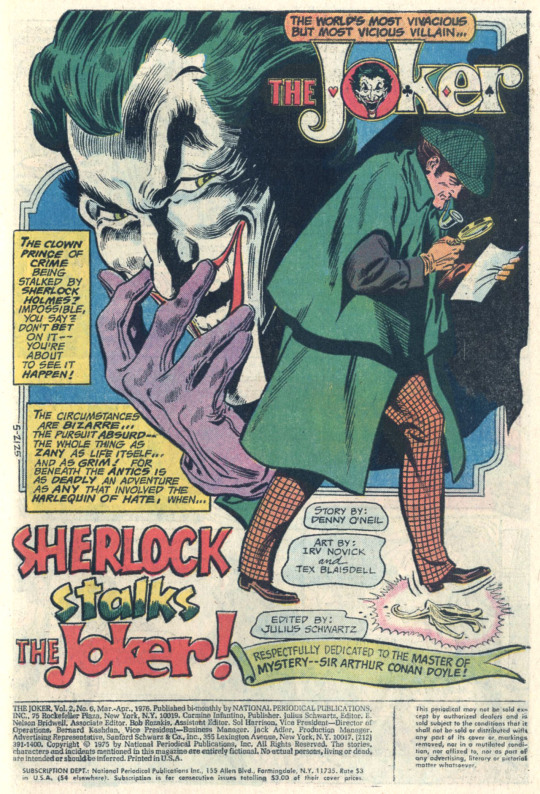 The Joker feels compelled to make a fool of Holmes, and so he’s plotted a series of crimes, each one based on a vintage Conan Doyle story (which sounds like an internet description of the BBC Sherlock series, somehow.) Clive and Watson are in pursuit, though, and Clive proves to possess all of the deductive skills of the character he was portraying. 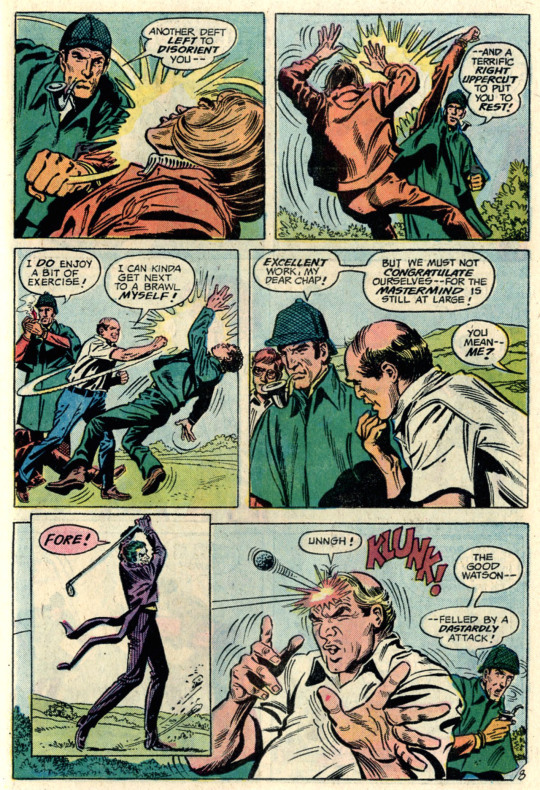 And so the actor and stagehand intervene as the Joker and his men attack a golf course, believing that they intend to abduct J.B. “Red” Wilson, the president of a newly-formed air-hockey league–thus making him a reference to “The Red-Headed League.” Unfortunately, they’ve got the wrong target–the Joker is actually after the flag for the fourth hole, “The Sign of the Four.” Score one for the clown, who’s enjoying having a bit of competition on what might otherwise be an uneventful crime spree. Clive and Watson make their way to a shipyard, thinking that they next crime will be a play on “The Bruce Partington Plans.” They’ve got the right ship, but the wrong heist again, as the tugboat that has pulled it to dock is names The Baskerville, and the Joker intends to swipe one of the hatch-dogs, or the “hound” of the Baskerville. But Holmes puts the pieces together, and he and his stagehand partner arrive in time to interrupt the heist in progress. 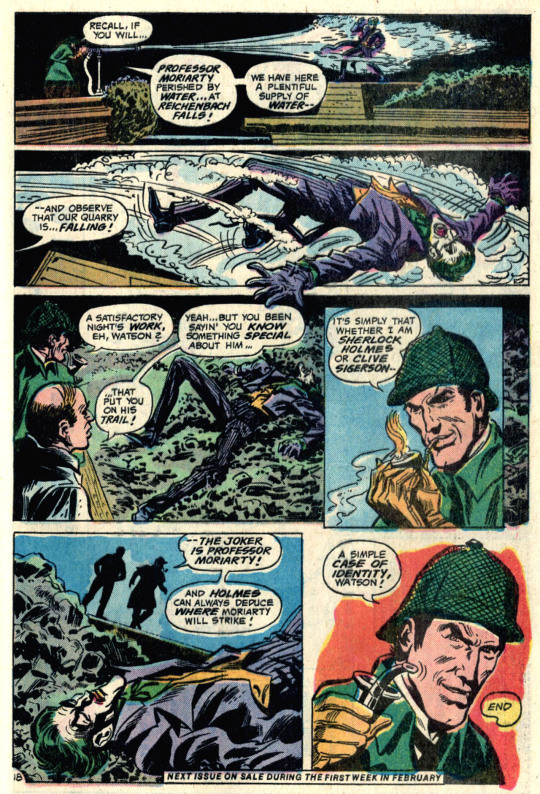 Frustrated by this turn of events, the Joker flees–but Clive is able to blast him with a water-pump, knocking him unconscious and making him ready for the police. This has to rank as one of the Joker’s worst defeats, being undone and beaten by a delusional actor and an untrained stagehand. 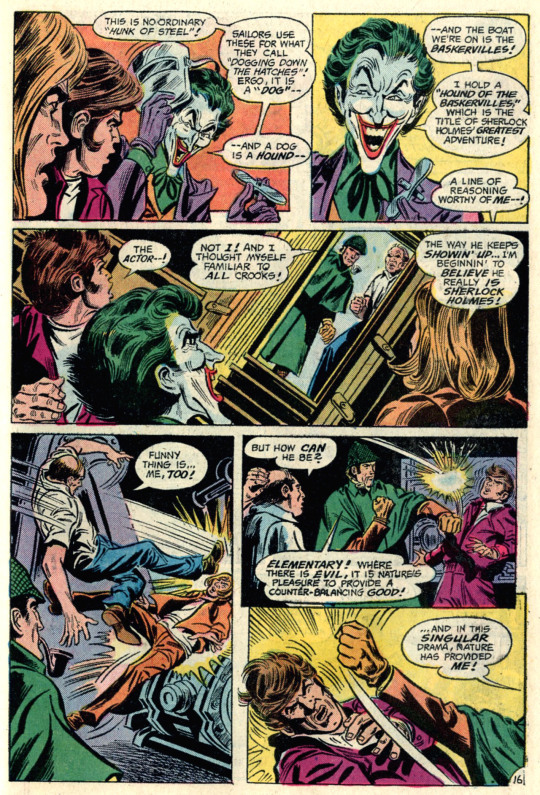 So it’s a fun enough story if you are a Holmesphile (which I was not), but for somebody who was interested in the Joker, he was almost a secondary character in someone else’s story here.